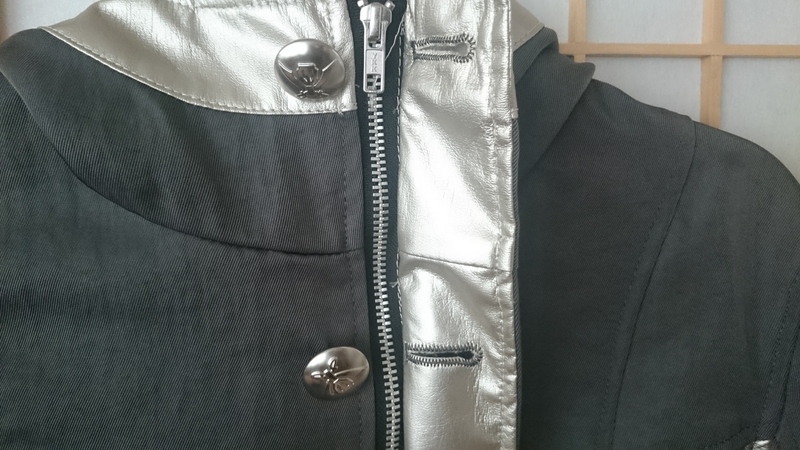 This review is for the official Gokai Silver jacket from Premium Bandai Fashion Net. It was released in 2011 and retailed for 25000 yen. At first glance this jacket isn’t too flashy. It’s body is mainly muted gray nylon twill with synthetic leather silver accents. I do want to point out the two functional pockets. Cosplay outfits can never have too many pockets. It’s always nice to have a place to keep your wallet, phone, badge, etc. while in costume at a convention. 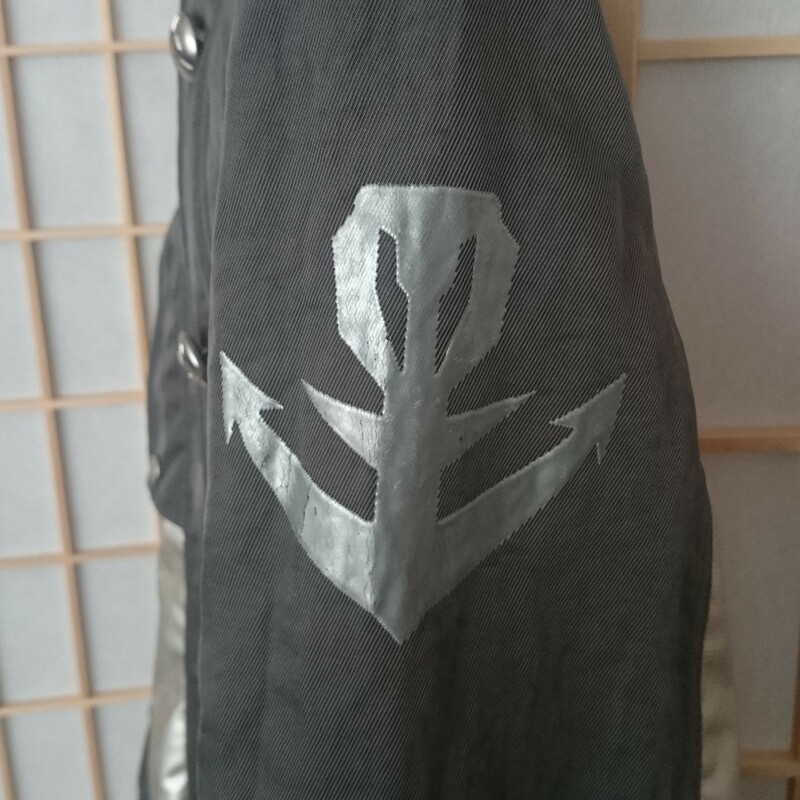 Looking at the back of the jacket reveals a hood and a large anchor detail. Also the silver accent continues on the bottom half of the sleeves. The cuffs are entirely silver. The Gokai Silver insignia can be found prominently on the upper part of the left sleeve. As you can see, my jacket already shows quite a bit of wear. I did acquire this second hand so perhaps the previous owner was a bit rough. I can’t help but think this needs some anti-aliasing now that I’m examining it more closely. Moving in for a closer look, the jacket is closed with both a zipper and the line of buttons. I must also note that as with the Captain Marvelous pieces, the Gokaiger insignia can be found on each of the buttons. 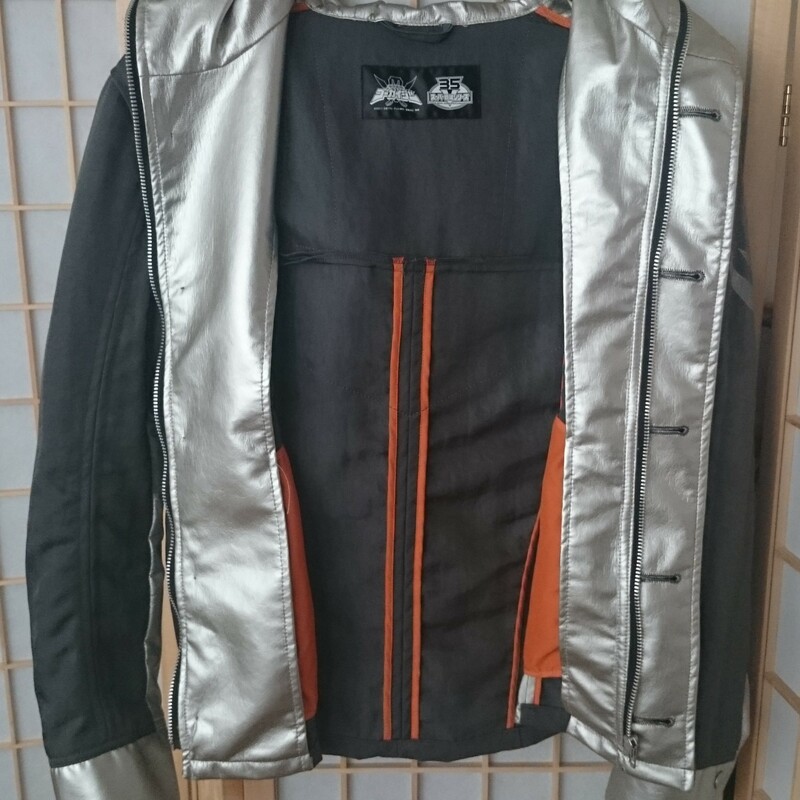 Appropriately for this jacket, they’re colored silver. Here’s a look at the inside of the jacket. There’s the Gokaiger and 35th anniversary logos on the tag. The silver accent proceeds prominently from top to bottom. 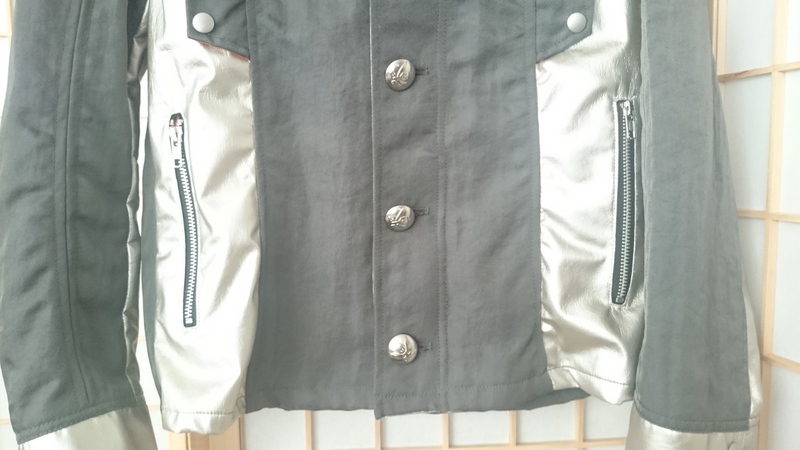 Unfortunately the buttons aren’t as reinforced here as they are on the Captain Marvelous coat. The stitching outline for the anchor detail on the back can also be seen on the inside. There’s also additional trim for the panels on the bottom half of the back. 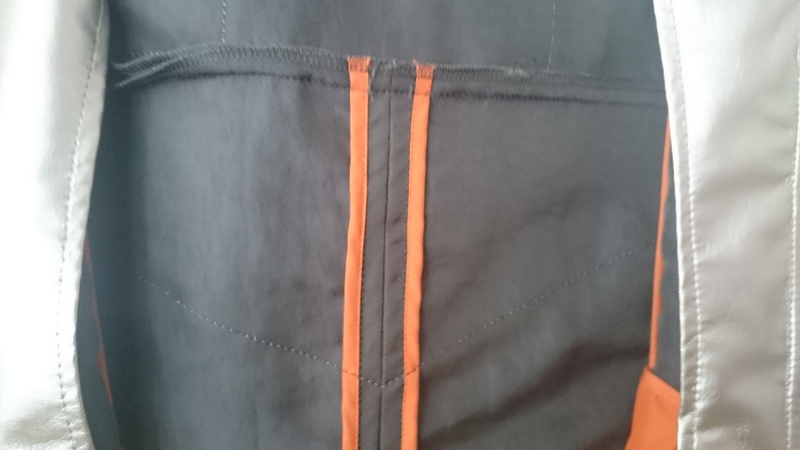 Finally I wanted to point out a small amount of white lining and the orange trim. I personally wouldn’t associate orange with gray and silver, but perhaps the color was used as a callback to Bouken Silver’s design. I do find it odd that they would go through the trouble of using orange trim on the inside since normally it wouldn’t be seen. It’s also extra work for anyone that wants to replicate this jacket exactly. I think this is a complex jacket. There must be at least a few dozen pieces of fabric that make up this jacket. It’s no easy task to sew them all together to achieve the symmetrical design. 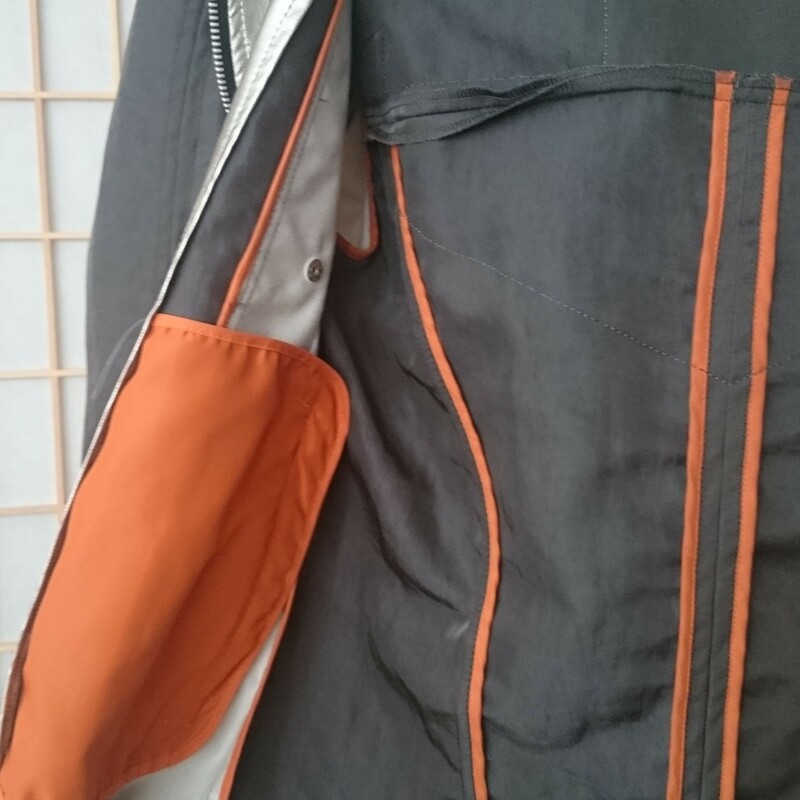 I don’t have anything bad to say about the construction of the jacket, but the materials, or at least the synthetic leather, isn’t expected to last long term. But so far it has held up fairly well. I do have issues with the fit of this jacket. It is small and only came in one size (one for men and one for women). Other than the Captain Marvelous vest, which also only came in one size (one for men and one for women), this jacket is the only piece that I own and don’t feel comfortable wearing. Admittedly, I own the others in Large, so I could certainly afford to lose a few pounds. Value The retail price is about average. Detail I must praise the amount of sewing required to put together this many pieces of fabric. Quality Synthetic materials all around. Sizing Small If you have any doubts about the size, it won’t fit. This is more of a high 3 stars than a solid 4 stars. Don’t be afraid to buy the jacket if you like it, but also take a look at other ones first. Dreamer searching for the land of tomorrow. 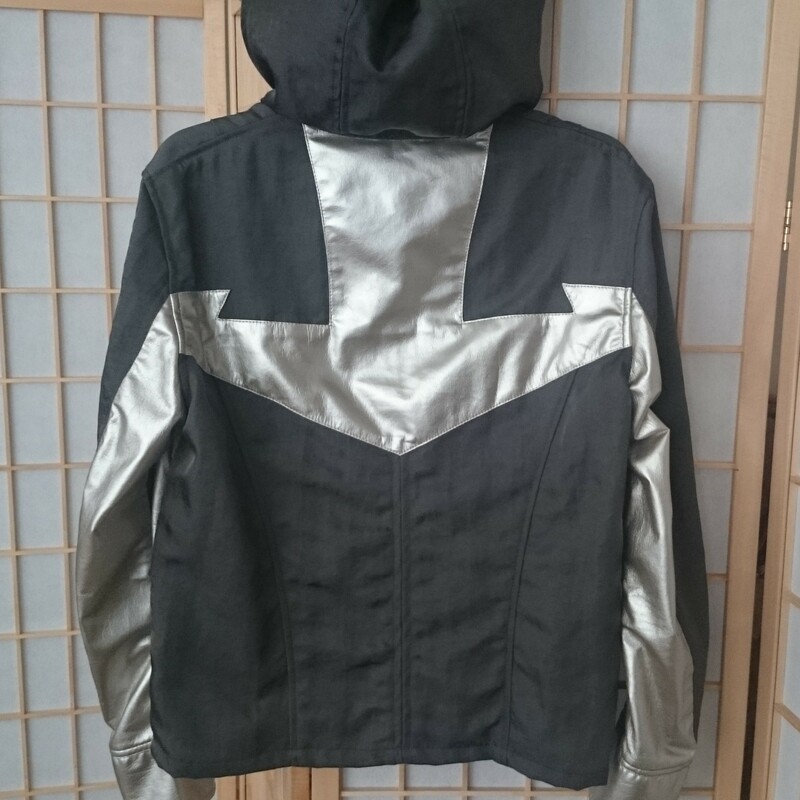 Unfortunately you will probably have to buy this jacket second hand as Bandai is no longer selling them. I would suggest looking on message boards and asking around in social media groups to find someone willing to sell theirs.